The following settings (accessed via MIDAS Admin Options → Manage MIDAS → Public) control the public "Web Request" and "Web Booking" interfaces for your MIDAS, allowing non-MIDAS users to check your room availability and make booking "requests" or actual bookings online. Turns the public "Web Request" interface on or off. 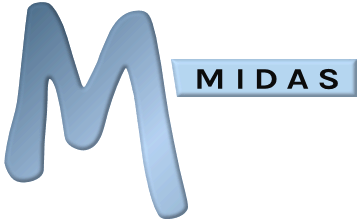 MIDAS allows administrative users to quickly approve all approvable booking requests. This setting controls the order in which booking requests are approved in such instances, as the order in which requests are approved may subsequently affect the availability of other booking requests. If this option is selected, all booking requests are automatically approved by MIDAS (availability permitting) as soon as they are received - they do not require approval by an administrator first. Turns the public "Web Booking" interface on or off. Before an individual can complete their web booking, they need to pay for their booking. Prior to the payment stage, a temporary "tentative" booking is added for the individual, which is converted to a "confirmed" booking once payment has been made. If payment has not made within the specified time frame (determined by this setting), then the tentative booking will be removed from the system and the individual would need to re-book. With this setting enabled, whenever an individual makes a web booking and associated payment, an invoice is automatically created and marked as paid for their payment. This setting controls how individuals select a venue (or venues) to request/book. This setting controls how MIDAS should select a suitable venue when automatic venue selection is in use. Prevent users from making last minute booking requests or public bookings by insisting that all requests/bookings are made in advance by a minimum number of days you specify. Prevent users from requesting/booking too far in advance by restricting the number of days ahead you will accept booking requests or public bookings for. Specify an absolute date past which booking requests and public bookings will not be allowed. When checking venue availability, if you don't want public to see who's already booked, set "Show on blocks" to "Unavailable". Public will then only see that a venue is unavailable, but won't see who's actually booked it. Alternatively, you may wish to display the name of the client, organization, or type of booking instead. Change the appearance of booking blocks when public check your venue's availability. If selected, a visual indication of each selected venues hours of operation will also be shown on the Web Request screen. If selected, the maximum capacity (occupancy level) for each venue will be indicated when selecting venues on the Web Request screen. This option allows you to restrict public booking requests and public bookings to individuals with certain email addresses. For example, if you were to enter "yourdomain.com" in this field, public booking requests and/or public bookings can only be made by persons entering a "@yourdomain.com" email address. So, if you only wish to accept booking requests and/or public bookings from people within your own organization, this setting can be used to filter out any third party requests/bookings. You can specify multiple allowed domains here in the form of a comma separated list. For instance, to only allow public requests/bookings from your own organization and hotmail accounts, you would enter "yourdomain.com,hotmail.com"
MIDAS Knowledgebase: I've enabled Public Booking Requests, yet when I visit the request page it still says it's disabled?